Otosclerosis is a localized hereditary disease of otic capsule which is characterized clinically by gradually progressive hearing loss with or without tinnitus and histologically by replacement of endochondral layer of otic capsule by bone which has increased cellularity, vascularity, and porosity. Various treatment options are available ranging from medical to surgical procedures. Stapedectomy is indicated when stapes is firmly fixed as demonstrated by an air-bone gap of at least 30 dB for speech frequencies and negative Rinne test result for 256 and 512 Hz tuning forks. Fully successful stapedectomy corrects the entire conductive component of the hearing loss. It also removes the Carhart's notch often with overclosure of air-bone gap. Teflon piston is widely used because of its low tissue reactivity, its affordability, availability, and few complications reported with its use. It is also reported to give satisfactory long-term hearing results and is, hence, recommended. Various diameters of Teflon piston have been used by different authors like 0.4, 0.6, and 0.8 mm to achieve satisfactory air-bone closure. We compared 0.4 and 0.6 mm pistons to evaluate the hearing outcomes in them. Air-bone gap closure of within 15 db postoperatively was taken as improved hearing. A total of 52 patients fulfilled the selection criteria for otosclerosis. There were 25 patients in group A and 27 patients in group B. A statistical analysis was performed using Pearson's Chi-square test and Fisher's exact test and also Wilcoxon signed rank test. Female to male ratio in our study was 1.6:1. The patients in both the groups were in 31 -40 years category. Majority of patients had bilateral disease and were uniformly distributed in both the groups (P > 0.05). The distribution of conductive hearing loss and mixed hearing loss was uniform in both the groups (P > 0.05). A total of 32 patients had second degree hearing loss (41-60 dB), of which 17 patients were of group A and 15 of group B. The third degree hearing loss (61 − 80 dB HL) was seen in 14 patients, 5 of whom were in group A and 9 in group B. The distribution was statistically insignificant in both the groups (P > 0.05). 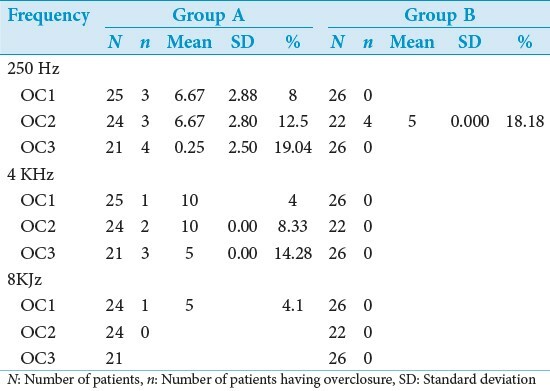 [Table 1] shows the mean air-bone gaps of groups A and B in preoperative as well as in the follow- up periods. During the follow-up period, the mean air-bone gap improved in both the groups. In group A, it was 6.88, 5.19, and 5.45 dB in follow-up period at 2 weeks, 1 month, and 3 months, respectively. Similarly in group B, it was 10.14, 7.25, and 5.39 dB in respective follow-up period, respectively. The difference was statistically insignificant among the two groups. Comparing the mean air bone gap in group A and group B at 250Hz, both the groups showed statistically significant improvement in hearing (P = 0.000). However, there was no difference in the intergroup analysis. The same results were seen at 4 KHz. At 8 KHz, an air-bone gap of 29.05 dB mean was found at the third follow-up. This was 22.11 for group B. In group A, the air-bone gap improvement in the third follow-up was not significant (P > 0.05), whereas group B showed a statistically significant improvement (P = 0.003) [Table 2]. [Table 3] shows the means of overclosures obtained at speech frequencies in the two groups. Group A had mean overclosure of 9.18 dB in the third follow-up. Group B had mean over closure of 7 dB in the third follow-up. A total of 52.38% patient of group A showed over closure at third follow-up, whereas only 34.61% patients of group B showed overclosure at third follow-up. The results show that patients in whom 0.4 mm piston was used had better overclosures in their air-bone gap compared with those with 0.6 mm piston. This difference was, however, statistically insignificant (P > 0.05). [Table 4] shows overclosures at 250, 4000, and 8000 Hz. The best mean of overclosure was 6.67 dB in group A and it was 5 dB in group B at 250 Hz frequency. Studying the overclosure at 4000 Hz, it was seen that only group A patients showed overclosure. Group B patients did not show any overclosure. However, it was statistically insignificant (P > 0.05). The incidence of vertigo postoperatively was studied. Patients who had a bigger piston (0.6 mm) had more episodes of vertigo compared with patients who had a 0.4 mm piston. However, the difference was not significant. The mean air-bone gaps at speech frequency that is 500, 1000, and 2000 Hz were calculated in both the groups in preoperative as well as in postoperative periods. It was observed that both the groups had marked improvement in their respective follow-up periods. The difference in the two groups was statistically insignificant (P > 0.005). Analysis at low frequencies, that is, 250 Hz showed that mean air-bone gap closure was better in group A (11.90 dB) than group B (15.32 dB). The difference was statistically insignificant (P > 0.05). Additionally, the overclosure at 250 Hz was found to be significantly better with 0.4 mm piston compared with 0.6 mm piston (P = 0.034). This finding reflects the advantage of using a smaller sized piston diameter of 0.4 mm as compared with 0.6 mm piston. A smaller size piston is more likely to provide better hearing improvement to the patient. Again at 4000 Hz, significant improvement was seen in both the groups and was significant (P = 0.003). Laske et al., , in their meta-analysis and systemic review of literature concluded that 0.6 mm piston is associated with significantly better results. Gristwood and Venables  concluded that diameter of the piston have little effect on the outcome, except at 6 and 8 kHz, where the slim piston appeared to have a significant advantage. They also concluded that there is no apparent advantage of one piston over other for hearing gains up to 4 kHz, at any time period up to 10 year after surgery. In accordance to our study, no difference in hearing gain between 0.4 and 0.6 mm diameter piston was reported by Shabana et al.,  Contrary to our observations, Donaldson et al.,  advocated the use of larger piston diameter to have adequate air-bone gap closure in lower frequencies. Grolman et al.,  compared 0.3 and 0.4 mm Teflon piston and found that 0.4 mm piston has a better postsurgical hearing result in the low frequencies. Marquet and Creten  reported ineffective air-bone gap closure at lower frequencies with 0.6 mm piston. This is contrary to our study as the air-bone gap closure was found to be comparable between 0.4 and 0.6 mm pistons at lower frequencies. The results of our study show that both 0.4 and 0.6 mm piston provide satisfactory hearing improvement with good air-bone gap closure at speech frequencies. This is contrary to earlier findings by Marchese et al.,  wherein they reported better hearing results with wider diameter piston at low frequencies. One unique finding which has been reported in this study is overclosure. At speech frequencies, 52.38% of patients of group A showed overclosure, whereas only 34.61% patients showed over closure. It was about 9.18 dB in group A and 7 dB in group B showing that patients with a smaller piston had better overclosure at speech frequencies. This has not been reported earlier. Similarly at low frequency that is 250 Hz, the mean overclosure was 6.25 dB after third follow- up in group A. Interestingly, none of the patients in group B showed any overclosure at third follow- up. At 4 kHz, only group A patients showed overclosure with a mean of 5 dB which was statistically significant. At 8 kHz, only group A patients showed overclosure. None of the group B patients showed overclosure. This finding reflects the advantage of using a smaller sized piston diameter of 0.4 mm as compared with 0.6 mm piston. A smaller size piston is more likely to provide better hearing improvement to the patient. Postoperative vertigo interestingly was more in patients who had a 0.6 mm piston. This may indicate advantages of putting in a smaller piston undergoing stapes surgery. A large cohort of patients may provide more scientific evidence in favor of a smaller piston for a lesser incidence of vertigo. Based on these result of our study, we would advocate 0.4 mm piston for effective air-bone gap closure. Using a larger piston of 0.6 mm diameter carries no advantage. Larger piston occupies larger space, hence, needing extra expertize on the part of surgeon, especially in cases of anatomical variations like facial overhang. The change of piston diameter from 0.4 to 0.6 mm does not have any advantage as far as hearing is concerned. Rather 0.6 mm diameter piston insertion requires greater surgical expertize, especially, in cases of anatomical variations. Hence, a 0.4 mm piston is better suited for obtaining adequate air-bone gap closure. 1. Cawthorne T. Otosclerosis. J Laryngol Otol 1955;69:437-56. 2. Schuknecht HF, Applebaum EL. Surgery for hearing loss. N Engl J Med 1969;280:1154-60. 3. Kartush JM. Ossicular chain reconstruction. Capitulum to malleus. Otolaryngol Clin North Am 1994;27:689-715. 4. Vartiainen E, Virtaniemi J, Kemppainen M, Karjalainen S. Hearing levels of patients with otosclerosis 10 years after stapedectomy. Otolaryngol Head Neck Surg 1993;108:251-5. 5. Sedwick JD, Louden CL, Shelton C. Stapedectomy vs stapedotomy. Do you really need a laser? Arch Otolaryngol Head Neck Surg 1997;123:177-80. 6. Laske RD, Roosli C, Chatzimichalis MV, Sim JH, Huber AM. The influence of prosthesis diameter in stapes surgery: A meta-analysis and systematic review of the literature. Otol Neurotol 2011;32:520-8. 7. Laske R, Roosli C, Chatzimichalis M. Prosthesis diameter in stapedotomy. Otolaryngol Head Neck Surg 2010;143:245. 8. Gristwood RE, Venables WN. Effects of fenestra size and piston diameter on the outcome of stapes surgery for clinical otosclerosis. Ann Otol Rhinol Laryngol 2011;120:363-71. 9. Shabana YK, Ghonim MR, Pederson CM. Stapedectomy: Does prosthesis diameter affect outcome? Clin Otolaryngol Allied Sci 1999;24:91-4. 10. Donaldson JA, Snyder JM. Otosclerosis. In: Harker E, editor. Otolaryngology Head Neck Surgery. 1 st ed. St. Louis. Mosby year book; 1992. p. 2997-3016. 11. Grolman W, Tange RA, de Bruijn AJ, Hart AA, Schouwenburg PF. A retrospective study of the hearing results obtained after stapedotomy by the implantation of two Teflon pistons of different diameter. Eur Arch Otolaryngol 1997;254:422-4. 12. Marquet J, Creten WL, Van Camp KJ. Consideration about the surgical approach in stapedectomy. Acta Otolaryngol 1972;74:406-10. 13. Marchese MR, Cianfrone F, Passali GC, Paludetti G. Hearing results after stapedotomy: Role of Prosthesis diameter. Audiol Neurotol 2007;12:221-5. Mohammad T. Khorsandi A.,Mir M. Jalali,Vahideh Shoshi D.